Cards are Near Mint or Better Condition. 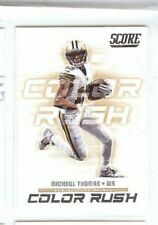 Michael Thomas (2) 2016 Contenders Draft Picks School Colors RC Rookie Card #6. Condition is Like New. Free shipping! You are bidding on a Michael Thomas 2016 Panini Prizm RC Prizm Refractor. Upon opening the pack the card was placed in a top load. Upon payment received the cards will be shipped in a protective envelope. Payment is expected within 3 days of the auction ending. Notes: POP 1 Ohio State and Saints Star! I always go worst case scenario. Most cards would grade much higher. Card which may be in Raw Card Review Holders are preliminary grades by Beckett at shows. The football card shown in the images is theexact card you will receive. Get it now! You will receive the exact same card as in the pictures!! NOTE: Concerning all raw cards: I am not a professional card grader, nor will I attempt to give a label to a card such as poor, good, mint, near mint. One of the best receivers in the NFL. 2017 PANINI XR MICHAEL THOMAS NEW ORLEANS SAINTS GOLD PATCH AUTO #/10 SP. Condition is Like New. Shipped with USPS First Class Package. The football card shown in the images is theexact card you will receive. Check out our large inventory of singles, rookies, autographs, lots, and jersey cards of your favorite teams, athletes and more . 2018 Spectra Michael Thomas Sunday Spectacle Green Relic 15/25 Saints. Condition is Like New. Shipped with USPS First Class Package. Card will come in pennysleeve, toploader and bubblemailer. CONDITION : Cards are NM/MT unless otherwise specified. We are not graders but will point out defects the best we can. Beautiful autograph serial numbered 240/299! MICHAEL THOMAS - NEW ORLEANS SAINTS - JERSEY CARD - SERIAL #'d 19/35 -NICE! Be one of only /35 people to own the fabulous card pictured above. I'm not a professional grader but would estimate this as Exc/NM.